This cold cast resin Crusader Knight is armed and ready to defend the Holy Land. 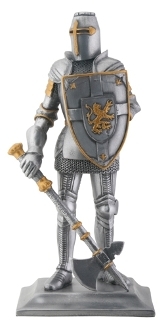 At 8.5 Inches tall, the Crusader Knight is an impressive figure, and a close look reveals intricate detailing. Each piece of armor is painted in tones of silver and gray, which offer a genuine steel appearance. The Knights chain mail coat is precisely crafted, and his shield, hefted in his left hand, is deep in detail and rich ornamentation. The shield is cold steel in color with gold accents and bears a central cross topped with a gold Rampart Lion. The Crusader Knight carries a brutally large battle axe, dark silver and ringed in gold. 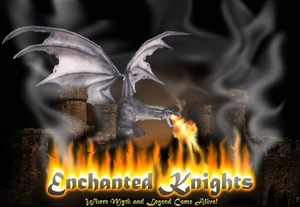 This superbly crafted knight statue will have a place of honor amongst your collection.